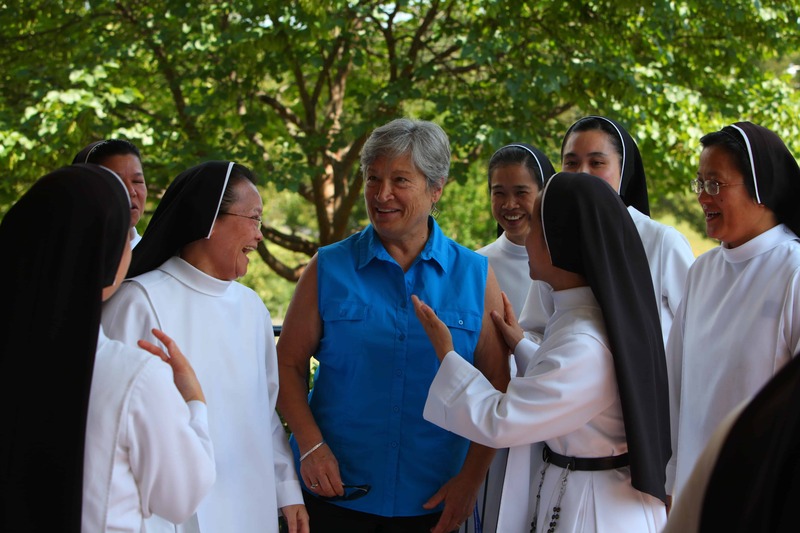 Our Vita Consecrata Institute co-hosts and partners the Institute on Religious Life. Welcome, we are looking forward to another great Summer in Front Royal, Virginia with you! Each summer our graduate school moves to Christendom College’s under graduate campus in Front Royal, VA for a 6-week residential semester. Set on a hill overlooking the Shenandoah River and a view of the Blue Ridge Mountains in the distance, Christendom College is a serene retreat where academic studies of God, Man, heaven and the wonders of our world bear much fruit. Though our home base is located inside the beltway of Washington, D.C. in Alexandria, VA, we love the opportunity to live, explore & study with students and the religious who come for the programs. To engage in the higher Theological studies, to look upon some of the natural wonders of Virginia, and to share the experience with likeminded individuals, is in itself a unique experience which nourishes the soul. We are blessed to be able to provide this opportunity to theological, classical language and religious students alike. In order that all the students, faculty and staff are able to fully appreciate and participate in the residential studies, we have put together a list of helpful hints from what to pack to library resource for students. We recommend students who have registered or who are in the process of registering take a few minutes before booking travel plans to read the following information as it is sure to provide students with an idea of what to expect. As always, we the Christendom Graduate School faculty and staff are here to answer questions, so please call us at (703)658-4304 or email us at graduate.school@christendom.edu, we are happy to help! Christendom College’s undergraduate campus is located in Front Royal, VA about an hour and a half outside of Washington, D.C. Christendom College offers shuttle service to and from Dulles International Airport (IAD) and the Vienna Metro Station (Orange Line) at the beginning and end of every summer session according to the dates and times listed below. Washington, D.C. is ranked #6 in the US for traffic and these shuttles have been arranged at specific times to make arriving and departing as smooth as possible since Dulles is over an hour from the campus and Vienna is about an hour away. Below we have provided information to help you plan your trip to the Front Royal campus as inexpensively and easily as possible. There is no charge to students who travel on the shuttles within these time-frames. Requests outside of these set shuttle times cannot be accommodated by the Christendom shuttle service. Shuttle services must be requested for each individual person traveling in your party at least three weeks prior to pick up. We will send an email within 5 days of a student’s arrival, confirming the time and place of the van pick-up, and the driver’s name and cell phone number. For questions of the shuttle services please contact the transportation office at 540-551-9170 . Please Note: All students are expected to meet AT Door #6 of Baggage Claim at Dulles and AT the South Kiss and Ride entrance of Vienna Metro Station according to the following times. Please Note: These times are for when the shuttle leaves the Front Royal campus and the approximate arrival time at Dulles and Vienna. TO REGISTER for shuttle transportation, please complete the appropriate form found at the Transportation Portal. Be sure to include both an email address and a cell phone number. You will receive a confirmation once the form is submitted. If you do not receive this confirmation, please call us at 540-551-9170 to make sure we have received your request. We will send an email within 5 days of a student’s arrival, confirming the time and place of the van pick-up, and the driver’s name and cell phone number. Please Note: Pick-up and Drop-off times are only estimation and can take longer or shorter depending on traffic. The Transportation Department allots extra time for all shuttle services, but cannot promise that shuttles will arrive at the specific time given the potential variables. For this reason, it is very important that the transportation office has a way to contact you. Please be sure to log an email address AND, more importantly, a cell phone number where the driver can reach you in case there is a delay. College Delay: If the college must delay a shuttle due to inclement weather, a staff member from the Transportation Office will contact all students scheduled for shuttles on their cellphones. For this reason, the Transportation Office requires that all students using shuttle service submit their cellphone numbers when requesting a shuttle. Student Flight Delay: Should a student’s flight be delayed, please call the Transportation Office phone number at 540-551-9170. If it is outside of business hours, please listen to the voicemail recording for instructions on how to reach a staff member via cellphone. If you have a last-minute delay, please call your van driver. Christendom Transportation cannot promise that they will be able to provide shuttle service for all delayed flights, but will do its best to provide adequate service. Students may arrive on campus on Saturdays after 3 PM or on Sundays prior to 6:30 PM orientation. Please Note: Access to the dormitories may not be available before 3 PM on Saturdays. Upon arriving, please proceed to St. Lawrence Commons where you will be directed to your dormitory and given maps of the campus. Departing students are asked to vacate the dormitories by 10 AM on the Saturday following the end of your program as cleaning services must have time to prepare the room for the next program arriving on campus. As an increased security measure, we have moved from punch code entries for the dorms to key cards. A key card will be issued to each student upon arriving on-campus. The key card will grant access to your wing in the dormitory. Upon arriving on-campus please proceed to St. Lawrence Commons to pick up your welcome packet and nametag with your assigned key card. Please do not lose the key card as replacement cards will require payment. At the end of your stay on-campus, all key cards are to be returned to your RA or the program coordinator Mrs. Tish McMahon. PLEASE NOTE: We ask that students leave the keycards with the Residential Coordinator or your RA prior to departing campus! Students may be FINED if the keycards must be replaced. We provide van transportation into Front Royal (5 miles away) twice a week to accommodate any needs you may have. Please check your orientation packet for more information about the van runs. Laundry facilities are found in the basements of all dorms. Christendom College in Front Royal backs up to the Shenandoah River and is a 10-minute drive to Skyline Drive the beginning of the Blue Ridge Mountains. We encourage students bring clothing that would enable you to enjoy the following on and near the campus: trails in the woods, canoes/kayaks, outdoor tennis, indoor basketball court, racquetball courts, volleyball, work-out & weigh rooms, recreation rooms with pool table, foosball, and TV. Summers in Virginia tend to be hot and humid, as such all of the buildings are air-conditioned (some can be quite cool at times so you may need a sweater.) Dress for classes and meals is casual, but we ask that no shorts or tank tops are worn to Mass. We have planned several recreational activities during the summer term. Please see the schedule of events in your orientation packet, and regularly check the bulletin board in the classroom area for updates, sign-up sheets, and additional information. Furthermore, special announcements may be made during the lunch hour, and/or via email, so please be sure to check your email daily. Tourist information about the Front Royal area is also located on the table in the lower level of the library. All students and VCI participants are welcome to use the Crusader Gymnasium from 6 am – 10 pm daily. Basketball / volleyball court, handball or racquetball courts, a fitness room with treadmills, elliptical, and a recumbent bike, and a weight room are all available for students. Christendom has canoes and kayaks are available for students at St. Brendan’s Landing. All users must sign a waiver form and return it to the resident assistants or the athletics department staff in the gym BEFORE using the boats. Please Note: There will be a “Gym & Boats” orientation for all students on the first Monday of each program in the gym. Please try to attend this session if you are interested in using the athletic facilities, canoes or kayaks. If you would like some instruction on how to use the canoes or kayaks, please attend the orientation and see the gym staff to make an appointment for a lesson. Please check your orientation packet for more information about the gym and boats. Saturdays & Sundays: Students are welcome to help themselves to breakfast bars, fruit, coffee, tea and juice. For students arriving on-campus outside of regularly schedule meal times need to eat either in the airport before boarding the shuttle or bring food with them. The kitchen closes and stores leftover food promptly. Please contact Chef Don in person or by email at donald.higby@christendom.edu the day before you plan eat on campus. Individual meal prices for non-resident students and guests are $7 per meal. Please pay the food servers. While on campus, students can receive mail c/o NDGS, Christendom College, 134 Christendom Drive, Front Royal, VA 22630. Mail is distributed to resident students and faculty during the noon meal by Walter Janaro (or at supper if it arrives in the afternoon). Students may give Walter outgoing mail at that time, or at his office in Regina Coeli (first floor) or just drop it in the box in the mailroom (also first floor Regina Coeli). Postage can be purchased from Walter. In an emergency, a message can always be left for a student at the college toll-free number: 800-877-5456. The towels are small and some students like to bring extras. You may also wish to bring an additional pillow or blanket. Laundry facilities are in the dormitory and are available to students free of charge. Students taking courses for credit are given single rooms whenever possible to facilitate deep study unless requested otherwise. VCI participants generally share rooms with those from their own religious order. To request a particular roommate, please write the name if the individual with whom you wish to share a room on your registration form or email Ginny Norris at vnorris@christendom.edu by May 15. No roommate requests can be accommodated after May 15, 2019. If a student has a physical limitation or restriction that may affect their stay or require special attention, please contact Ginny Norris. Ginny will place students in rooms that are appropriate for their needs and are available (for example, if you cannot easily climb stairs having access to the elevator). Please Note: Christendom is a walking campus. Although the campus is not large students need to be able to walk to and from buildings or to provide their own transportation. The dining and classroom facilities are all handicap accessible. All residential registrations and special requests MUST be received by May 15. Accommodations after this date cannot be guaranteed as space is limited and housing assignments are made in early June. On every wing and floor of each dormitory, bulletin boards can be found with general information such as emergency contact numbers, directions to medical facilities, local maps, etc. For your safety, a Golden Seal Security Officer is on duty every night from 8 pm – 6 am in Regina Coeli (administrative building) or driving around the campus. Students will receive more information on safety and security during the student orientation and a staff member will be available for questions. Mass is offered in Christ the King Chapel at 11:30 AM Mon – Sat and 10:00 AM Sundays. *This may vary the week of July 4th. The VCI is in session 4 out of the 6 weeks of the summer program. For further details please see the summer calendar of events in the welcome packet. No early morning Mass is celebrated during the first and last weeks of the summer program as it is before and after the VCI program. Confessions are available 11 – 11:30 AM Mon – Sat, 9:15 AM on Sundays or by appointment. The Christendom Chaplains (Fr. Marcus Pollard and Fr. Tom Shepanzyk) are available to graduate students for any spiritual needs; students can contact them at the rectory (540-622-6128) or by email fr.pollard@christendom.edu and fr.tom@christendom.edu. All new credit students (and any returning students who do not still have their library/ID cards from previous years) taking courses for credit can obtain their library cards at the library on the first Monday of their stay on campus or any of the following days. Audit students (including VCI participants) may also obtain library cards and borrowing privileges if they wish, please ask at the library desk. Library orientation is held on the first Monday of each program. All students, but especially new students, are urged to take advantage of this helpful introduction to theological research, the library and available resources. Director of the Libraries Andrew Armstrong and Reference Librarian Stephen Pilon welcome inquiries from students. The Christendom Library catalog may be accessed online from the library webpage at https://libguides.christendom.edu/home. MA and Classical Language courses will be held in the lower level of St. John the Evangelist Library. Please see your welcome packets for further details. Vita Consecrata Institute classes will take place in the Chapel Crypt. Elective courses will be held in the Lower level of the SJE Library. All students are requested to read the Bulletin of the Christendom Graduate School which is available online at. The Bulletin contains pertinent information about course requirements, academic policies, financial policies, academic calendar, etc. Students are encouraged to study the Bulletin and refer to it when they have questions or problems. It is your responsibility to understand what plagiarism is and to avoid it. Plagiarism may be broadly defined as the presentation of someone else’s ideas, expressions or other content, without due acknowledgement, in academic work submitted as your own. Plagiarism is a serious infraction of Christendom’s policies. The normal consequence ranges from a grade of ‘F’ (either on the relevant assignment or for the whole course) to dismissal from the Graduate School. If you have any questions, please do not hesitate to ask any professor, Joseph Arias, Dean of Students, or R.J. Matava, Dean of the Graduate School. By submitting work as a Christendom student you (at least) implicitly accept Christendom’s standards of academic integrity (published in the graduate school Bulletin and on the Christendom website). Internet sources should be used judiciously and attribution should be made for all content that is not original to you or common knowledge. Please see the Student Resources page of the website or speak with your professors for further guidance. The Graduate Student Resource Center is a great tool for students who are looking for examples of papers, bibliographies and footnoting information. If you need additional help with papers or you are not sure if something is correct or you need additional help please ask a professor or contact the Writing Center Coordinator and Library Assistant Olivia Colville at olivia.colville@christendom.edu for assistance. A listing of textbooks can be found on the Current Course Offerings web page as well as on the course information page on our Populi platform. Please see your registration page and click on the link to the course for further details. Consecrated Life & Spirituality – Father Thomas Nelson, O.P. For students who are undecided or wish to explore the program further Dr. Joseph Arias is available or you can call the graduate school at 703-658-4304 for details. May God bless your studies and we hope you enjoy your Summer in Front Royal!